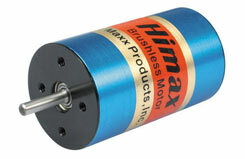 All Products > "333040 Multiplex Himax A2825-2700 Motor"
The perfect motor for high-speed models. Our recommendation for the FunJet and similar jet aircraft. For 3-D model aircraft weighing 800g to 1400g, for aerobatic models up to 1700g, and for trainers up to 2200g.